On a street in New York, a car has just exploded. From the rooftops, the Turtles observe a pair of detectives deduce that it was done by a nut with a homemade explosive. 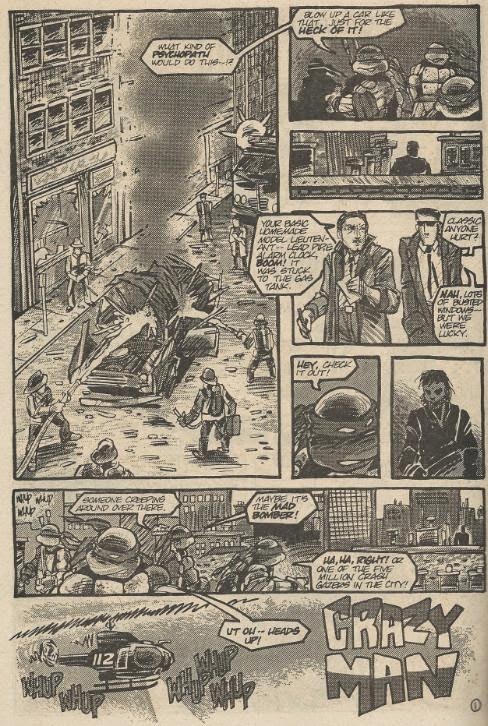 As the Turtles ponder how someone could be crazy enough to blow up cars for the heck of it, Mike sees a shady-looking individual slink down an alley. He’s about to go after him when a police chopper spots the Turtles. They head for the shadows, losing their suspect in the process. The Turtles decide to split up and see if they can’t track him back down. Mike strikes pay dirt at the south end when he spots the crazy man putting a bomb inside another car’s gas tank. The car explodes and the guy runs off, leaving Mike to give chase. The other Turtles see the explosion and head in that direction. Mike follows the crazy man into the subway, startling a pair of vagrants as he runs past them. The other Turtles see Mikey go in from a distance and follow, giving the vagrants an even bigger scare. From the shadows, Mikey watches the crazy guy and realizes that the cars were simply test runs; he plans to blow up a whole train car full of people. The other Turtles arrive in time to apprehend the crazy guy before he can set the timer on his bomb. Mike, though, is so enraged that he begins violently threatening the horrified man. The next day, at a newsstand, a customer buys a copy of the New York Post. The cover reads “Vagrants capture mad bomber, say ‘Aided by aliens’”, accompanied by a picture of the two subway vagrants standing triumphantly over the tied-up crazy man. The customer reconsiders and asks for a copy of the New York Times, instead. *CHET ALERT: Page six, graffiti on the wall reads “Where’s Chet?” The name “Chet” was a recurring gag by the Mirage crew in many of their old comics as…they just liked that name. *The credits at the end of the strip do not list Jim Lawson for his work, though he’s listed in the index in the back of Gobbledygook. On the flipside, the credits in the strip list Steve Lavigne, though he is not listed in the index in the back of Gobbledygook. This has to be one of my favorite short back-up strips. It’s just a fun, action-packed TMNT adventure that paces everything out over its eight pages just right. 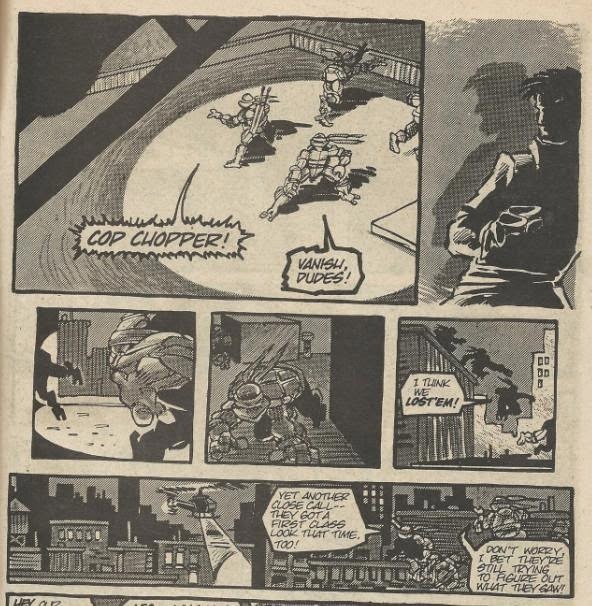 “Crazy Man” doesn’t have any relevance to the main TMNT series, like “Complete Carnage an’ Radical”, but it isn’t all crazy and all over the place like other short back-up strips, such as “Technofear!! !” or “You Had To Be There”. 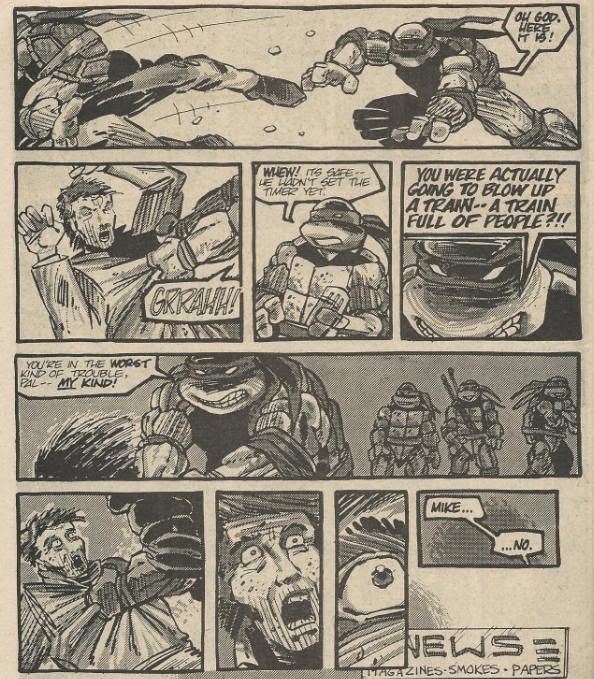 It’s just a short, exciting TMNT adventure that's grounded in reality. Ryan Brown’s inks and Lawson’s tones add some great atmosphere to the piece, such as the smoking wrecks of the cars or the lights from the helicopters and street lamps contrasting with the darkness. One of my favorite “gags” in the story is that the credits for the strips are given on the last page, printed on the newspaper the customer is reading. Not much else to say. It’s just a gritty little 8-pager, though it earns some points for not being ridiculous or wacky. Just the Turtles hunting down a mad bomber in classic Eastman style, and there’s nothing wrong with that. aha, I remeber this one. One of my favorite shorts of TMNT. After some of these terrorist shootings lately, a fantasy like this where things turn out how we would like them to in real life feels good to read. TMNT #12 (vol. 1) serves that purpose as well.